Keystone species are defined as a plant or animal that plays a unique role in the way the ecosystem functions. But what would happen if that species were removed? What ripple effects would be caused by the absence of this species? We can examine these questions by looking at the wolf population in Yellowstone National Park. 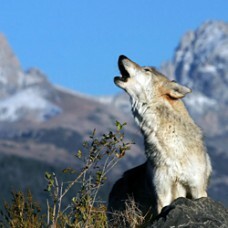 Wolves once flourished in Yellowstone and its surrounding areas. However, soon after the area was settled, misperceptions caused by fear and hatred fueled a large extermination effort of the wolves. For nearly 70 years, wolves were absent from Yellowstone. During this time, the ecosystem changed and diminished until scientists realized the value of the wolves and reintroduced them to Yellowstone. This model, built in iThink, uses storytelling to understand the dynamics of this keystone species. What animals were affected by their presence or absence. See how wolves play a part in not only population control of their prey but other animals and even plants far down the trophic levels. Copyright © 1985- isee systems, inc. All Rights Reserved.